HURRICANE SANDY – Are you really coming?! If indeed, Miss Sandy turns out to be worse than expected and if all communication channel fails. Here is a message to all the people far and near who have touched my life. Leaving behind few thoughts that over the years, have become the pillar of my life . It is very well captured in this Wishing Fountain picture that I took a while back at the New York Botanical Garden. Potential: The ripple effect –Never underestimate your own potential and never think that,you are just one individual and cannot make an impact or achieve your goal.Every single action of yours creates a ripple effect. Slowly but surely, you are one step closer to your goal. Stay positive and never lose your self confidence. 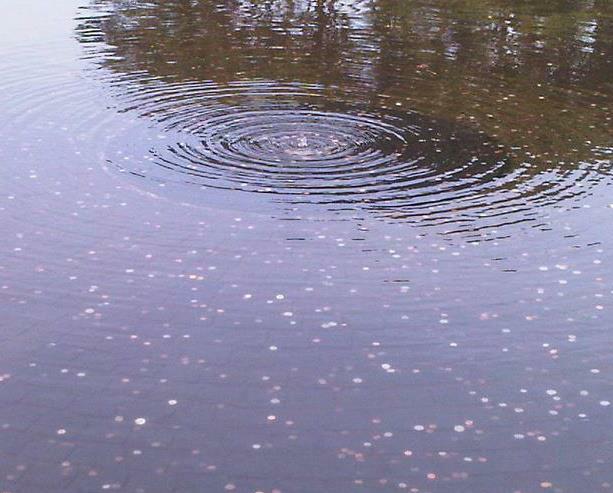 Contentment: Just like the way we throw our coins in the fountain and make a wish for something better. Haven’t we all done that at some point in our life ??! In our pursuit for happiness, we fail to see & appreciate what we have , instead we run after things that we don’t have. In the end, we end up losing what we have. Reflection: The reflection of the tree in the fountain reminds me of one of the key fundamental principle which helps one to maintain sanity and humanity. In this fast paced life where time is money and money is time, we lose track of the true essence of life . It is when we need to pause and do a reality check through reflection on our own actions. Last but not the least, I will definitely continue to pray to Buddha to tame Miss Hurricane Sandy. I hope this will be a wake up call to all of us to live each moment positively.